This December, enjoy Red Ribbon's new Chocolate Walnut Fudge with Hershey's Dark Chocolate. It was launched during a blogger's event and I had the privilege of getting a first taste at it. Below are the details of the press release. Over the years, Red Ribbon Bakeshop has come to be known as the leader and innovator in cakes. With its best-tasting signature cakes like the Black Forest, Chocolate Mousse and Chocolate Marjolaine that Filipinos have come to love and enjoy, Red Ribbon has become an essential part of every gathering. Aside from these signature cakes, Red Ribbon has not failed to surprise us year after year with innovative and delightful cake offerings that have instantly become dessert favorites and instant additions to any gathering—from the family favorite S’mores Chocolate Cake to the feel-good comfort of Cookies and Cream with Oreo and, most recently, White Forest which brings everyone’s favorites together. As we usher in the Holiday Season, all of us are bound to be looking for that extra special cake for the season’s much-anticipated gatherings with family and friends or to gift to our loved ones. And, just as we thought we’ve seen and tasted everything, Red Ribbon caps off the year with yet another delightful offering, perfectly in time for the season of giving and celebration—the new Chocolate Walnut Fudge with Hershey’s Dark Chocolate. Chocolate Walnut Fudge with Hershey’s Dark Chocolate is Red Ribbon’s newest addition to its Premium Selection line. 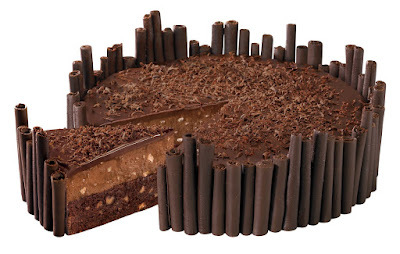 It is made of a layer of creamy chocolate mousse on a bed of moist fudgy brownie, both loaded with chopped walnuts and finished with dark chocolate ganache, sprinkles and long chocolate curls all made with Hershey’s Dark Chocolate to make it even more irresistible. So, as this season calls for a more special dessert for our gatherings and gifting needs, we need not look further than Red Ribbon’s new Chocolate Walnut Fudge with Hershey’s Dark Chocolate. This ultimately indulgent cake is guaranteed to make any gathering more special. The new Chocolate Walnut Fudge with Hershey’s Dark Chocolate is available in all Red Ribbon stores and select booths for P680.00. Offered only this holiday season, it’s the perfect ending to any celebration.